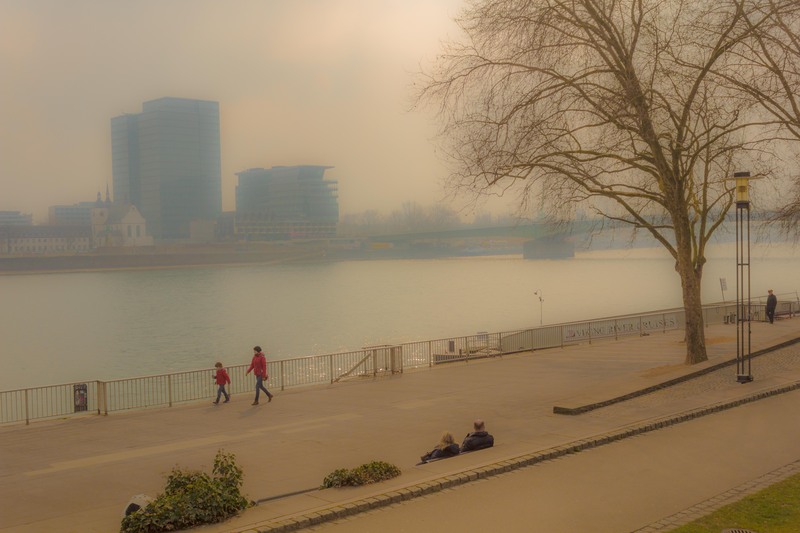 We spent a few days in Cologne over Easter. I took lots of photographs. Here are two that have had some tweaking in Lightroom. I’m especially pleased with the second one. The effect is almost like an impressionist painting to my eye. 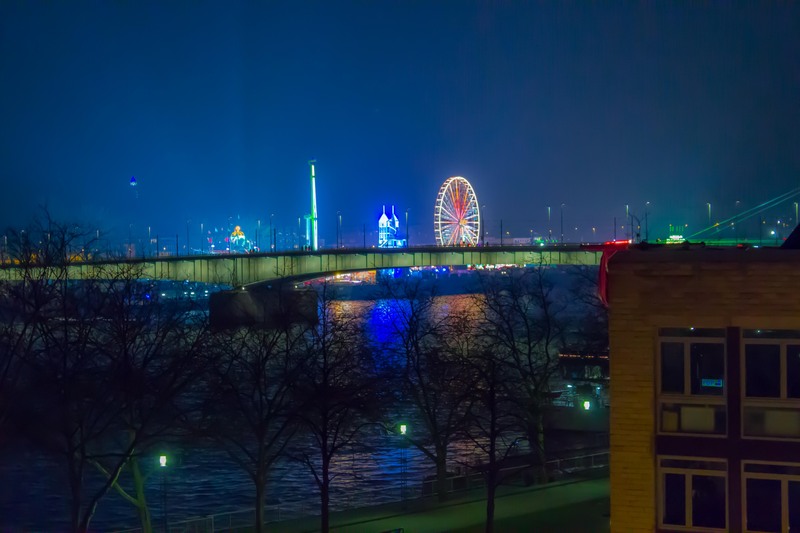 Cologne by night; a funfair across the Rhine. It didn’t actually look like this. The things you can do with software. To Glasgow, then, and a weekend visit to my Mum. The kids and I caught the train to Stansted on Friday afternoon, to find the security theatre in full force. Although we made EasyJet’s last checkin time with a good ten minutes to spare, I really thought we would miss our flight when we joined the back of one of two or three giant, slow-moving queues. Especially so when, after a few minutes, we realised that we were in fact at the back of a queue for another checkin desk. We weren’t alone in this error, though: the queues mingled, and quite a few others had made the same mistake. But in the end it wasn’t that bad. The queue began moving fairly quickly — or smoothly, at least — and while it was frustrating, it was bearable, as long as you didn’t let yourself get frustrated. The passport/boarding-pass-control desk looked a right mess, though, covered as it was by abandoned bottles, cosmetics containers and what have you. To be honest, I’m not actually sure why the queues were so long. The only things that have changed in security terms compared with a few months ago are the prohibited items in hand baggage, and the enforcement of the “only one item” rule (I’m sure this has been the rule for decades, but it just wasn’t strictly enforced). Both of those issues should be dealt with at checkin, so when you get to the security gates you should be ready. Every bag and coat is x-rayed, as before: but there should be fewer bags; everyone goes through a metal detector, just as they always did. There was a “please take off your shoes” section after the metal detectors, but as we paused at it, one security guy called, “Not everybody, not everybody,” and waved us on. I suppose people were randomly chosen, and incidentally, everyone I saw taking their shoes off was white. This may, of course, just mean that people who look like terrorists (whatever that may mean) are not travelling, from fear of being hassled. I conclude that the only reason for the giant queues must be stupidity: there must be people who, even though they are asked about prohibited items at checkin, and even though this stuff has been in the news for weeks, still have drinks in their hand luggage, and then have to stop to abandon them at security. Or who try to take more than one item on, even though they’ve been told not to. And yet, I didn’t see much of that happening. I really don’t understand why the queues got so big. There were plenty of security staff on duty, too. Coming back, things were much less fraught at Glasgow Airport, as they generally are at smaller airports, in my experience. Throughout, I have to say, all the security staff we encountered were cheerful, polite, and helpful, while doing a largely thankless, probably quite dull, job, filled with seemingly-arbitrary rule changes handed down from above. I can’t really fault them, no matter how daft some of the things they have to enforce may be. A last thought: we are being conditioned to accept travelling with photo ID, even within the country. It was strange to see everyone queuing up to get onto a flight to Scotland, with their passports ready. Now I’d be quite happy to see EU passports issued by the Republic of Scotland (as long as it was a republic), but for now, it was still a journey within the UK. And the strange thing is, it seems to be the airlines that are driving this, not the authorities. I have had to show photo ID on RyanAir and EasyJet, but a few months ago — this year, certainly — I flew to Scotland with BMI Baby, and not only did they not ask for ID, but I didn’t even have to see a human to check in: hand baggage, a credit card, and a self-checkin machine, and there I was. That was before all the recent fuss, true, but RyanAir (and possibly EasyJet) have been asking for ID for years. Are they secretly being used by the government to get us used to carrying ID cards? And if so, why is it only some airlines? Or am I being unreasonably paranoid? ‘Cos I only want to be reasonably paranoid, you know. I don’t mean to come over all disgruntled again, but on arriving at Waterloo (by bike) this morning, I found two changes which seemed designed to inconvenience travellers, with no obvious gain. First, at the entrance I usually roll in by (the wide one next to the Costa Coffee shop), they have added two bollards. Quite widely spaced, so no immediate problem for cyclists or pedestrians: except that anything unnecessary in the way is a distraction and just adds to the complexity of a journey. And what purpose do they serve? All they can possibly be for is to stop cars and vans driving in that way. And while that is something that has been technically possible until now, I wasn’t at all aware that we had a problem with it. Indeed, apart from floor-cleaning machines and those little luggage carts, the only motorised vehicle I’ve ever seen inside Waterloo is an ambulance. I do hope they haven’t stopped those from getting in. Perhaps more significantly, they have added some sort of tall rack containing, I think, paper timetables or other leaflets. But they’ve put it in the middle of the floor near the the departures screens. So not only is it in the way, but from certain positions it obscures the view of the screens. Screens which have been hard enough to see since they were introduced, replacing the old big boards. The screens’ main fault is that they are in the wrong places: over some of the shops which form islands in the concourse, instead of over the entrances to the platforms. As well as that, the text on them is smaller than the old boards, so you have to stand closer to make them out. This last will have the effect of amplifying the blockage caused by the rack (this can be proved by a simple piece of geometry, which I won’t go into). At least the rack looks as if it should be easy to remove; but bah, grumble, etc.